BML Munjal University, Gurugram has advertised in THE TIMES OF INDIA newspaper for recruitment of Professor / Associate Professor / Assistant Professor job vacancies. Interested and eligible job aspirants are requested to apply on or before 22nd April 2019. Check out further more details below. 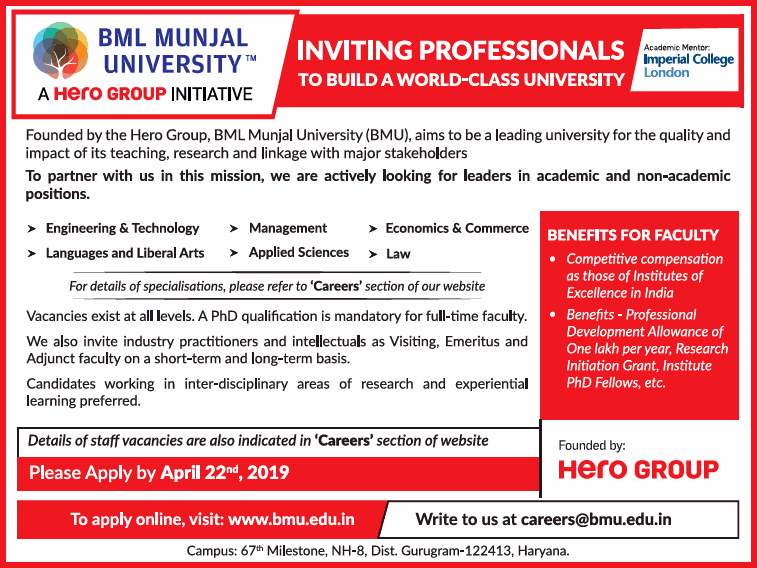 About University: BML Munjal University (BMU) seeks to transform higher education in India by creating a world class and innovative teaching, learning and research environment. Founded by the Hero Group and mentored by Imperial College London, BMU is a not-for-profit initiative offering undergraduate and post-graduate courses. How to Apply: Interested candidates are requested to send updated CV along with copies of certificates and recent passport size photo to the email address given below.